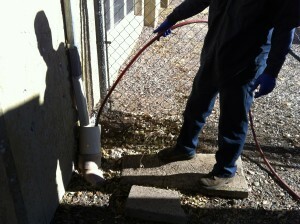 Residential, Commercial & Industrial Services, Lakewood CO | Colorado Sewer Service, Inc. Residential, commercial or industrial – we do it all. Drains clog over time. Whether this occurs in the kitchen, bathroom or main sewer, our highly-trained drain cleaning professionals can solve all of your drain problems. Sometimes, to fix the problem, you need to see the problem. That’s where camera and video inspection comes in. In the last few years, video inspection has become an indispensable tool when it comes to identifying and resolving plumbing issues. Using state-of-the-art fiber optic cameras, which are lowered into your plumbing system, we can see the condition of your pipes, recognize cracking and breaking or identify damage caused by tree roots or crushing. A repair is not always necessary and general maintenance can usually solve your problem and save you thousands over time. High pressure jetting is the process of forcing a highly pressurized stream of water through your pipes to quickly break apart clogs and obstructions. 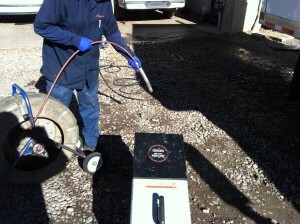 As opposed to other sewer cleaning methods, high pressure jetting flushes blockage completely and is the most effective way to clean silt and sediment out of drains and is second-to-none for grease removal. Areas in green are within our regular service area. Areas in yellow have a $25.00 trip charge. If you don’t see your area on the map below or you’re not sure which area you’re in, call us for availability or a recommendation. Some areas we will service for a trip charge, but call for availability and price anyway.